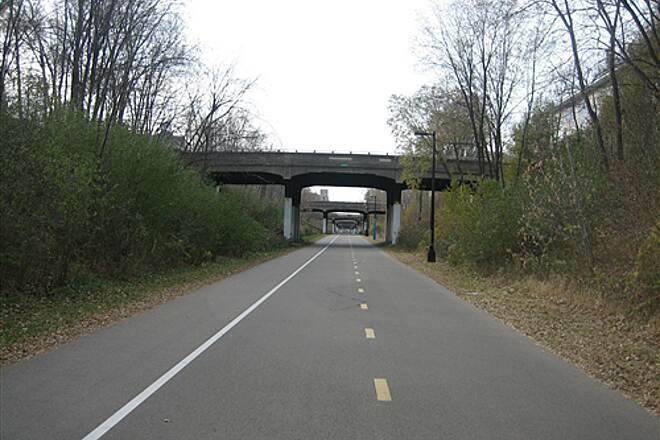 The 5.5-mile Midtown Greenway follows a former railroad corridor through the heart of south Minneapolis, heading due west from the Mississippi River to the neighborhood of West Calhoun in the scenic Chain of Lakes area. 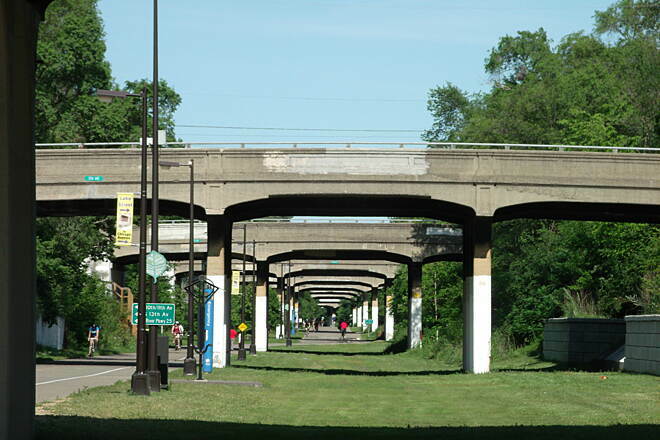 The paved pathway is only one block north of the improving Lake Street corridor and runs parallel to the road for most of its route, thus providing a safe alternative for cyclists and pedestrians to travel instead of the busy street. Much of the trail is below grade because of a 1912 mandate by the Minneapolis City Council for the Milwaukee Road to dig a trench for its rail line. 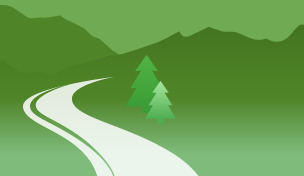 Presently, the decision ensures that trail users have minimal contact with vehicular traffic. 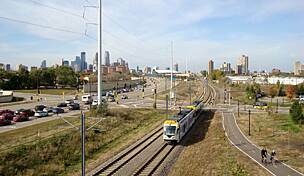 East of MN 55/Hiawatha Avenue, the Minnesota Commercial Railway operates trains on the corridor to this day. 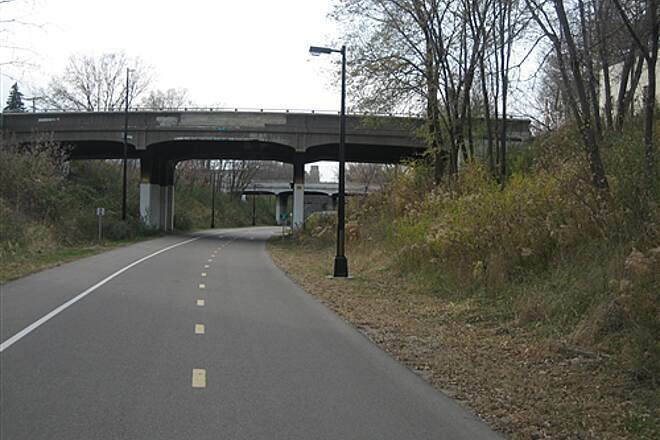 This section of the Midtown Greenway is an example of a successful rail-with-trail project. 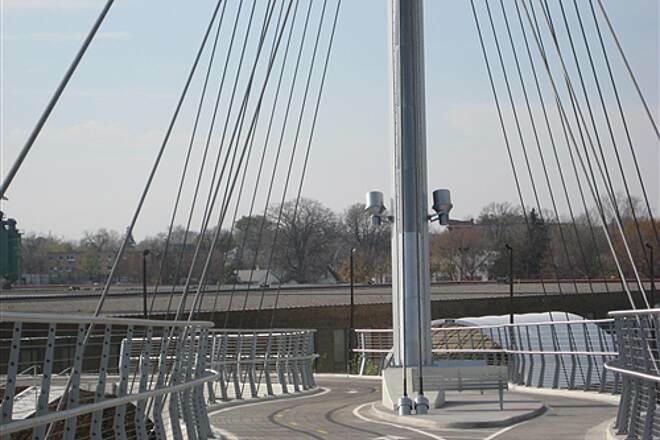 Busy Hiawatha Avenue is crossed via the stunning Martin Olav Sabo Bridge, which is exclusively for bicycle and pedestrian use. Just east of the bridge, trail users can pick up the Hiawatha Trail to travel north to downtown Minneapolis or south to Minnehaha. 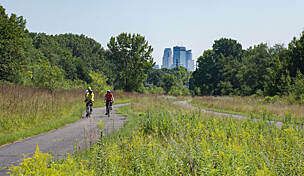 On its western end, the Midtown Greenway connects directly to the Cedar Lake LRT Regional Trail, which links Minneapolis to the suburbs of St. Louis Park, Hopkins, and beyond via other connecting trails. 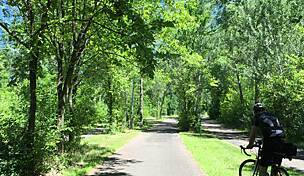 Traveling north on the Kenilworth Trail—also located at the Midtown Greenway’s western end—leads trail users to the longer North Cedar Lake Regional Trail. East of Hiawatha Avenue, a short segment of the trail is above ground; to the west through much of south Minneapolis, it runs below street level. 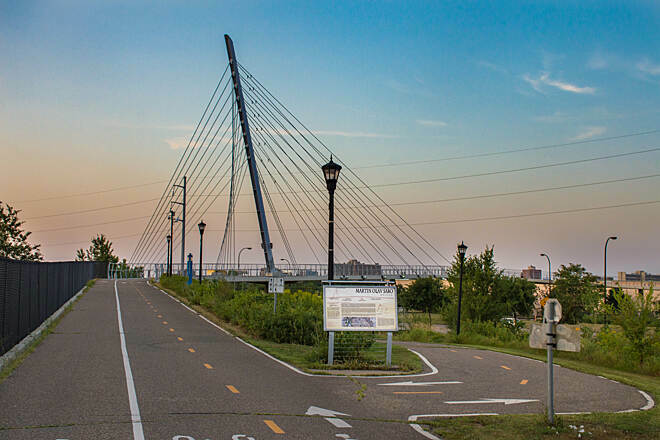 In the east, bicyclists and pedestrians can join the West River Parkway Trail for a longer ride, run, or walk along the Mississippi River. Just a few blocks east of the intersection with the West River Parkway, a ramp at Brackett Field Park lets users access/exit the trail. There is ample parking on nearby streets. 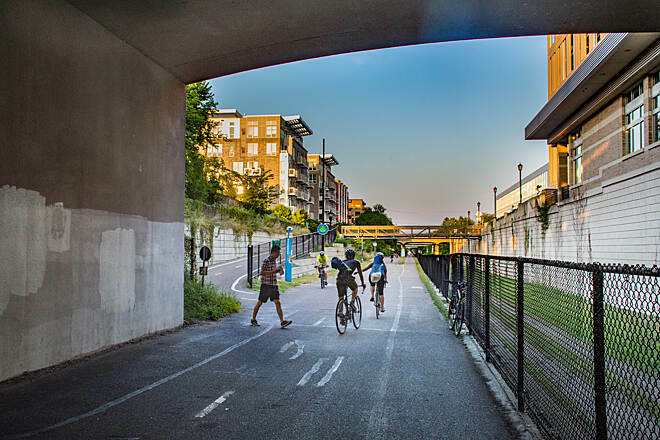 In the future, a streetcar line may be installed in the Midtown Greenway corridor, although a separated trail would still be maintained. 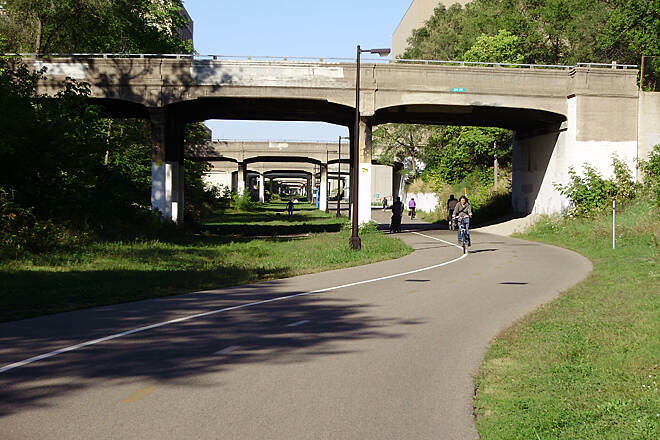 There has also been local interest in extending the trail east over the Mississippi River into the Prospect Park neighborhood of Minneapolis and onward into Saint Paul. 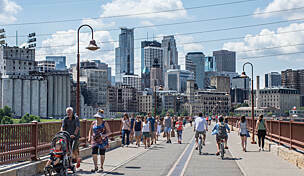 The Midtown Greenway connects to the West River Parkway Trail, which users can take south to Minnehaha Regional Park or north to other trail intersections heading into downtown or across the river to the University of Minnesota. To access parking at Brackett Field Park, take I-94 E. to Exit 235A toward Riverside Ave./25th Ave. Merge onto S. Ninth St., and then immediately turn right onto 26th Ave. S. In 0.5 mile turn left onto E. 25th St., and in another 0.7 mile turn right onto 36th Ave. S. Go 0.4 mile to E. 28th St., and in 0.2 mile turn left onto S. 39th Ave. to reach Brackett Field Park. The trail has multiple access points throughout downtown. The Greenway is an amazing place to ride! 10/10! The flatness of the path as well as the infrequent car crossings make it perfect for getting on your bike and flying down the path. Be sure to check out the murals along the way! However, don't stop at Freewheel, bad service and are not WTF friendly. Great for families, friends, and dogs. Can't wait to bike this trail everyday in the summer! Helps turn a recreational system into a true transportation system. 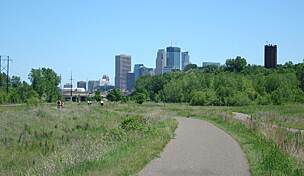 Terrific trail thru Minneapolis corridor, trail is flat. Need to slow down near cafe's (observe posted slow signs) otherwise great family bike ride. Just like the other reviewers that are raving about the Midtown Greenway I like this trail a lot. It is a very convenient trail to quickly go to uptown, downtown, Target Field or to the West River Parkway. It is a bit busy at times on nice days but more often than not it is used by a large number of commuters. The local bike shop that is located at the trail is a good place for a coffee or a quick snack. My favorite time on the trail is winter and early spring, especially when there is fresh snow. Because of the good use and excellent maintenance of the trail the snow is quickly removed by maintenance crews. The trail can be tricky when there is ice, especially under the many bridges it takes a while before all ice is gone. 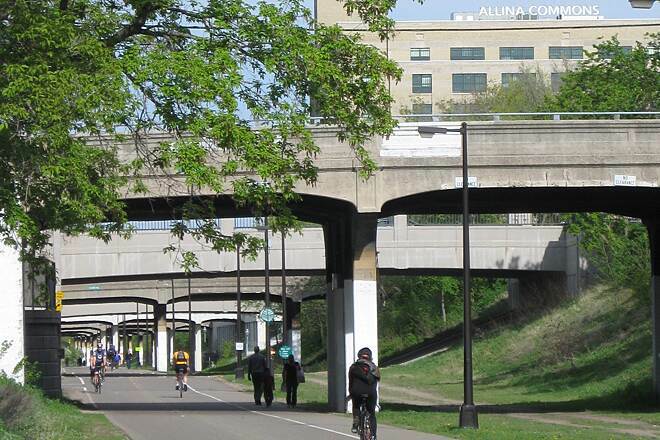 The Midtown Greenway is superb urban trail that cuts through the heart of south Minneapolis from the western suburbs to the Mississippi River. 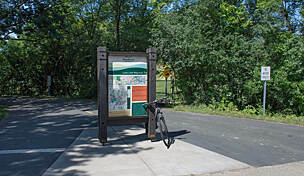 Its a really good ride of about 20 miles to start at Minnehaha Park, take the parkway around the lakes, then connect to the Midtown Greenway. 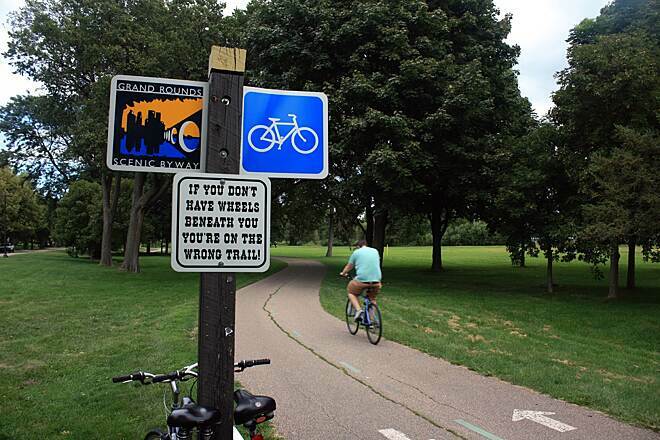 This is a trail that bikers of all abilities should like. My wife and I took our bikes up to Minneapolis on a trip to visit our son who lives there. 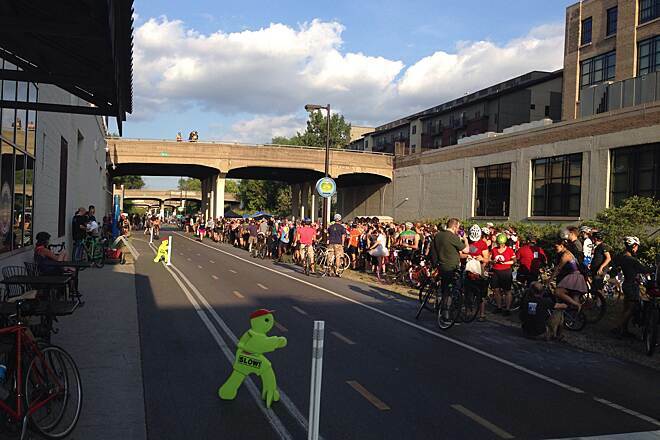 In general, the biking is fantastic in Minneapolis and the Midtown Greenway is awesome for getting around. Combined with all the other trails in the area - WOW, you can bike for days. We have nothing like this in the greater Cleveland area! What an excellent and memorable trip - can’t wait to head up again in 2013!! What every trail should be!! 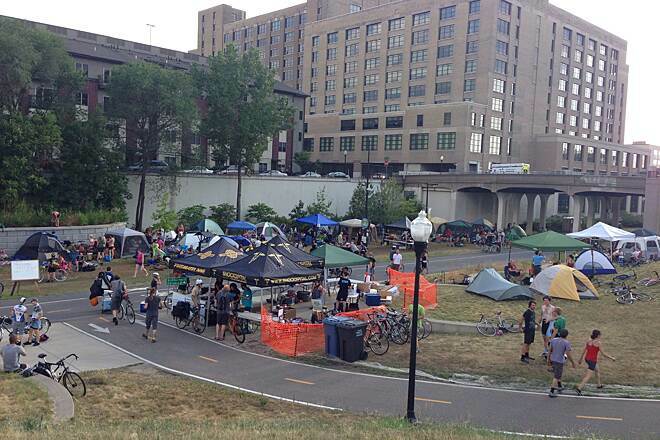 The Greenway is more of a bike freeway than a recreational trail, but what a magnificent bike highway it is! Located in an old railroad trench, the trail lets you zip across the city from border to border without ever having to stop for traffic. The asphalt trail is wide, smooth and well-lit with a separate lane for pedestrian traffic. So far, it has been impeccably maintained and kept very clean. On the western end, the trail connects seamlessly with the Southwest LRT trails that take you through Hopkins and all the way to Lake Minnetonka or the Minnesota River. The eastern end connects to the path bordering the light rail line, which provides an off-road trail all the way to the West Bank and over the freeway into downtown. 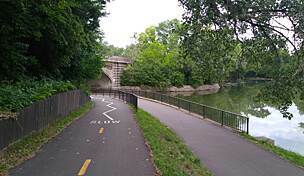 Or you can continue east to the Mississippi River, which has its own set of trails. Tip: you can ride across the showy but completely unnecessary "flyover" bridge at Hiawatha, but it's actually faster and easier to just cross at the light. The only downside is the limited access. The portion of the trail that is down in the trench can only be reached via ramps that are located 1/2 mile apart. 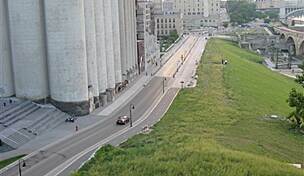 Some of the access points are tricky to locate and they don't all connect to good bike routes (specifically, the Nicollet ramp, which is best avoided). On the other hand, the trench traverses some sections of town that I would rather not ride through, and I feel much safer down there than on the surface streets. Speaking of safety, this trail is very heavily used, even at night. You're never alone down there, and I've never seen dubious looking characters lurking under the bridges (something I worried about a little bit when the trail first opened). The lights are on all night and there are also emergency phones every half-mile or so. Best place to stop for lunch: the Midtown Global Market in the old Sears Building. Best new addition to the trail: Freewheel Bikes has opened a small storefront right on the trail by the Midtown Market that offers a juice bar, public toilets, bike lockers, and even showers! Plus bike paraphernalia, of course. Trail is compete to the river! 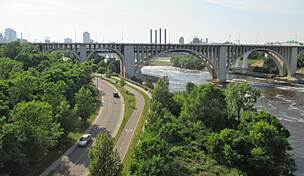 This is a great trail running through the heart of the Uptown area of Minneapolis. 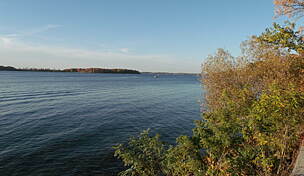 It starts in Hopkins to the west and extends east all the way to the Mississippi River (about 12 miles). At the Mississippi, it connects with the trail along the west side of the Mississippi for even more great biking. 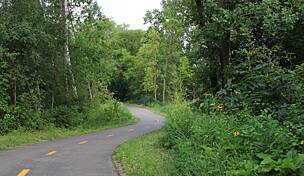 "Best thing about this trail is that you can access side trails to many swimming beaches on Minneapolis' beautiful lakes. And they are enlightened enough there to say ""swim at your own risk"" when there are no lifeguards present"
This trail is now extended out west to Hopkins. It goes about two miles west of Highway 169. You can turn north at 169 and take a big loop and head back and connect to the Cedar Lake Trail and head back to Minneapolis. They are now working on the portion that goes east to the Mississppi River. "This trail is beautiful! It's wide, non-congested, nestled in the heart of the city, is easy to get to and is well kept. Parking is ample. It connects to the chain of lakes and several other paths. It's perfect for in-line skating, biking and walking. I used to live a block from this trail and I miss it! It's a must-do when in Minneapolis! Also, there's a couple bike rental shops two blocks away on James and Lake St. "